Magnus Carsen is the sole leader again at the Shamkir Chess tournament in Azerbaijan. The World Champion was worse against Hikaru Nakamura but won anyway to set his personal score with the American to 10 wins and 0 losses in classical games. The games Radjabov-Mamedyaro and Karjakin-Caruana ended in draws. In the B group Pavel Eljanov caught Etienne Bacrot in first place by winning their individual encounter. The seventh round of the Shamkir Chess tournament started with two rather quick draws. The game between Teimour Radjabov and Shakhriyar Mamedyarov was a rather friendly affair, like so many encounters between the two Azeri top players have been. In fact, of their eight previous classical games that can be found in the database, only one did not end in a draw - the one at the 2010 Astrakhan Grand Prix, when Mamedyarov mysteriously lost on time. Today the two played an English/Catalan hybrid where White enjoys a tiny edge. Radjabov played it safe with 15.Qe2, and soon after almost all the pieces were traded. Sergey Karjakin and Fabiano Caruana reached move 51, but the game really lasted only 23 moves. From a 8.Rb1 Gruenfeld, in no time an ending was reached that looked familiar to experts: it was from Giri-Caruana, Zug 2013. “After the game I realized it's a very tricky ending and I analyzed it very deeply, but I couldn't remember everything. It's a little bit worse for Black but objectively it should be defendable,” said Caruana. Every round in the A group there has been at least one decisive game, and it wasn't different on Sunday. Magnus Carlsen also won his second game in Shamkir against Hikaru Nakamura, and so it's the World Champion again who tops the standings alone, with three rounds to go. Yet again Nakamura managed to get a promising position (during their press conference Caruana and Karjakin agreed that it was dangerous for Carlsen), only to spoil the advantage and even lose. It reminded of course of the dramatic game he played against the same opponent in February in Zurich, but there it was different: Nakamura was clearly winning. Today the American GM had a big advantage and felt he was winning, but he couldn't point out after the game where exactly. It's probably move 26. The B group is suddenly all open as tournament leader Etienne Bacrot lost his first game, to Pavel Eljanov. The two are now in shared first place with two rounds to go. Eljanov has White against Guseinov and Black against Abasov, while Bacrot has Black against Motylev and White against Safarli. The rounds start at 12:00 Amsterdam, 6am New York and 3am Los Angeles time. 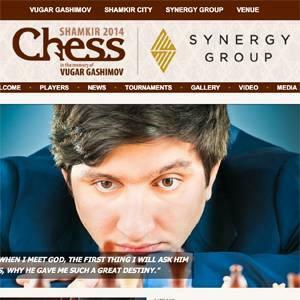 The official website is www.shamkirchess.az. Chess.com offers daily live commentary at www.chess.com/tv. Games via TWIC.